Built in 2012, this collection of 30 concrete and bamboo bungalows is run by a local couple. Along the beach are a few rows of air-con bungalows, all with wooden detailing and verandas, double beds, TVs, safes and hot-water showers in the bathroom. Up in the hill, and reached via a steep (and sweaty!) 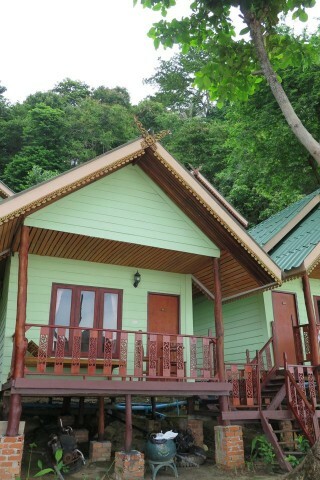 climb, are the fan bamboo huts, also with hot-water showers and a choice of double or twin beds. The air-con bungalows offer better value with their sea views and easy access. We think mosquitoes and other critters could be a problem in the fan bungalows especially with their shady jungle setting, so don’t forget the bug spray. A path behind the resort leads over the hill to Ton Sai village, but most will opt to go by boat, so you’ll need to factor boat transport costs into your budget if staying here (200 baht per person). The thatch-roof restaurant is a cosy gathering spot with a pool table, and it’s where you can organise tours or boat transfer. We were told there’s "free but not good" WiFi here at the restaurant/reception area, but couldn’t check it given that there’s no electricity from 06:00 till 18:00. The staff here are friendly but don’t speak much English, so communication could be a challenge. PP Power is worth considering if you’re looking to stay on a more remote beach, though in this price range Tohko Beach Resort just a few beaches away is a better choice. Some of the high-season prices for PP Power found on online booking sites are outrageous so best to view or contact them directly first before booking.